Summer had made an early appearance in central New England. The weather was unseasonably warm, with temperatures hovering near 90 degrees, but on June 8, the temperature dropped over 15 degrees in Worcester, MA. This was due to an unusually cold air mass and cold front arriving from the west. 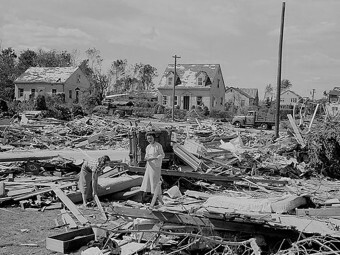 This weather system wreaked havoc in the towns of Flint and Beecher, spawning tornadoes that killed 116 people. When this system arrived in Worcester, it clashed with warm air from the southern states, a rarity for the New England region. Meteorologists saw the data and strongly suspected tornadic activity was a possibility in the area but believed making that knowledge public would incite a panic. Instead, they broke out their brand new alert system and released the first severe thunderstorm watch in Massachusetts history. In other words, most people were blindsided when the tornado ripped through the area. It had been a rainy day in central Massachusetts on June 9. A strong line of thunderstorms formed in New York State during the afternoon and began moving east. Just before 4:30 pm, a funnel cloud appeared by the Quabbin Reservoir near New Salem, Massachusetts. This quickly spawned a tornado in the nearby town of Petersham, where the first two victims died. 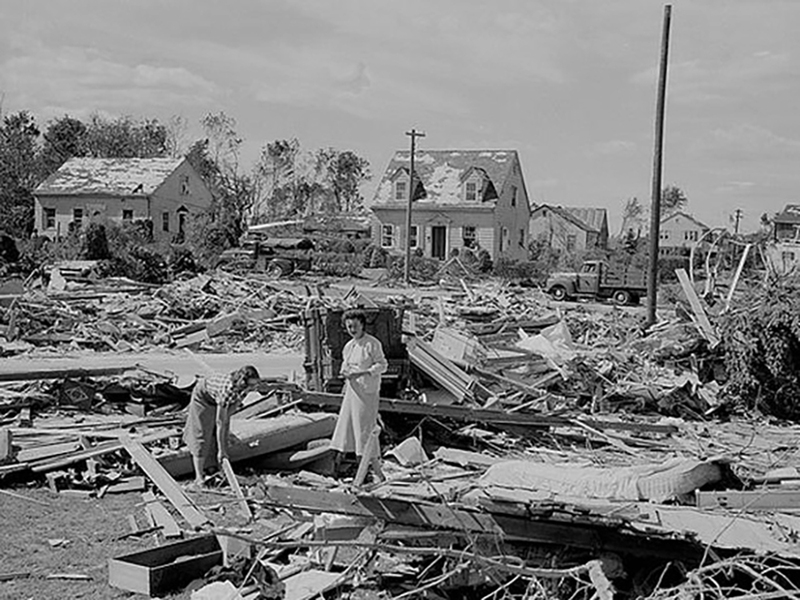 The tornado tore through Rutland and Holden, killing eleven more people before reaching the city of Worcester at approximately 5 pm. And then the largest tornado to ever hit New England (F4) unleashed its full fury. People watched cows fly through the air, and had their shoes blown off their feet. They looked on as houses were lifted from their foundations and thrown around like toys, and the water was sucked from local ponds. Ross England was a young boy when he rode out the storm with his mother and three brothers huddled behind a couch under a stairwell. The tornado raced through their apartment and the family lost everything. A tornado warning was issued at 5:45, but saying this was too little too late doesn’t even begin to cover it. When all was said and done (right around, oh, 5:45 pm) 94 people were dead, another 1,000 were injured, and am estimated 10,000 had lost their homes. The tornado caused $52 million in damages, which translates to about $450 million today. The Worcester tornado has become part of New England folklore. Like the Blizzard of 1978, it’s part of the regional mythology. Stories about where you were, or as time passes on, where your parents or grandparents were at the time, get passed down like recipes for baked beans or heirloom quilts.